One week the carpool of women coming to the meeting fell apart and the meeting was canceled. Not knowing that the meeting was going to be cancelled, Mona mentioned the Lighthouse meeting at another Bible study she was attending a few days earlier. Now the meeting was cancelled and Mona could not retrieve the invitation. Much to Mona’s surprise, 8 new ladies showed up for the meeting and brought food with them. Now, this new group of women is interested in starting an Aglow group closer to where they live. Ellison Bay Aglow believes that women are hungry for fellowship and that by simply opening your home to your neighbors, God will meet their needs in powerful ways. You are invited to our annual March Aglow Luncheon featuring Irish Stew and Corned Beef and Cabbage. We will come together to thank God for evangelists such as Saint Patrick who introduced Christianity to the country of Ireland and our own Billy Graham, who took the Gospel message into all the world while touching millions of lives in America. If anyone has a personal testimony of how an evangelist changed their lives we hope you will share with us your story. We meet at 12:30PM at Door of Life Church on the top of Little Sister Hill in Sister Bay. The date is on the fourth Thursday, March 22nd, 2018. You may bring a side, salad or dessert to share. Call or email Faith Murray for information. (920-421-1477). And be sure to be wearin’ the GREEN! PS: Below is the link to the latest word of inspiration from our Aglow International President. Be blessed! You look like you are having so much fun. Too bad I live so far away. May the Lord grow you in abundance in every way your heart desires. Dear Nellie, Thanks for your prayer and good words for Ellison Bay Aglow. You are a blessing! 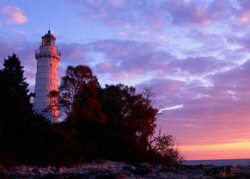 Look at Ellison Bay Lighthouse, Bright and Shinning and full of Beautiful AGLOW people!